Robert Whittaker is coming home for his upcoming middleweight title defense against Kelvin Gastelum. 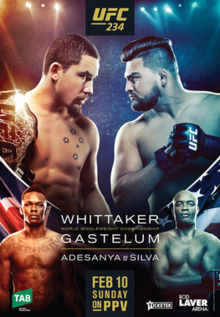 UFC 234: Whittaker vs. Gastelum is an upcoming mixed martial arts event produced by the Ultimate Fighting Championship that will be held on February 10, 2019 at Rod Laver Arena in Melbourne, Australia . UFC middleweight champion Robert Whittaker (20-4) will defend his middleweight title against Gastelum (15-3) at UFC 234 on Feb. 10 at Rod Laver Arena in Melbourne, Australia, the promotion announced Tuesday morning. The date was first reported by ESPN. Whittaker and Gastelum are currently being featured as opposing coaches on season 28 of The Ultimate Fighter and it was previously announced that Gastelum would challenge for the middleweight title at an unconfirmed date. Both fighters appeared on the show as contestants earlier in their careers (Gastelum on TUF 17, Whittaker on TUF: The Smashes), winning their respective seasons. This will be Whittaker’s first official title defense. The 27-year-old Sydney resident won a split decision over Yoel Romero at UFC 225 this past June in what was supposed to be a championship bout, but Romero failed to make weight for the contest, rendering himself ineligible to win the title.